Right, I'm familiar with that aspect of how site selection works (I got my membership to Worldcon 76 by upgrading from Advance Supporting to Attending). It's usually the cheapest way to get either a Supporting or Attending Membership, and a growing awareness of that is also a likely factor in more people participating. But my understanding is that the ability to buy an Advance Supporting Membership online is fairly recent -- I remember people talking only a few years ago about the difficulty of doing so with a credit card, rather than by mailing in a check. I tried to look into when that part of the process changed, but my quick research didn't turn up any details. It might be one of those things that varies by Worldcon. 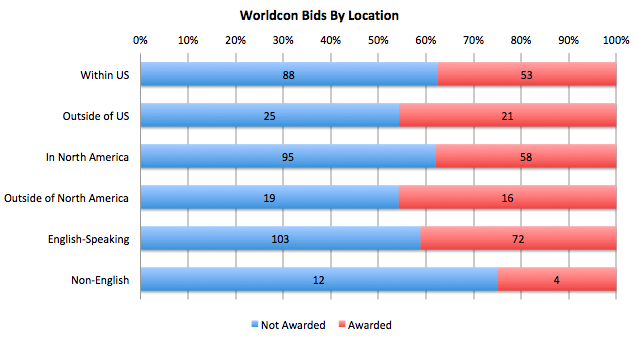 Buying a site selection ballot in advance varies by worldcon and most Worldcons make it difficult. Considering that they are capable of conducting an electronic ballot for the Hugo Awards, I always find it very annoying that online voting for site selection is so badly organised. Wait for an email with the token (it doesn't appear on-screen in the account). Write the token on to the PDF. Note that the email I just got was my Hugo token not my site selection token because the site selection email arrives five minutes later. Print out another copy, write the correct token on, fill all my details in again. Find an envelope and send it by international mail. Hope it arrives in time. Why they can't use the online voting system that they already have for the Hugo voting is entirely beyond me, but most Worldcons are the same. is so the con stays opaque and hard to change by design to discourage young upstarts from coming in to "ruin" things. Although I have grown more cynical than I was in my Youth about this issue, so maybe I am just bitter. There's no really good reason why Supporting members couldn't participate in Business Meetings - combine a livestream and a remotely logged-in voting system (and the ability to speak over an audio-livestream remotely). Even if that tech is too hard (and bear in mind that they regularly fail to manage live-streaming the Hugo Awards, which should be a much simpler setup) they could set up a proper proxy voting approach. Clearly not every vote is set out in advance (people can rewrite the proposals in the middle of the meeting) so you couldn't just designate the votes in advance (and there's no point in having a debate if everyone has voted in advance) but you could award a proxy to someone that you trust who is attending the meeting. The fact that this doesn't seem to have been proposed in 50-odd years is suspicious (they could even have a rule that Attending members physically at the conference can't have a proxy so someone can't just collect proxies in the bar and walk in with a block vote that outvotes everyone actually in the room). One of the problems with sorting out the online stuff is that there isn't a "they" - there isn't a permanent official group responsible, but each worldcon is independent of the others. This doesn't stop a concom deciding to set up a permanent system for registration, Hugo voting and site selection voting but it does mean that they can't force following cons to use it. If you wanted to do this properly, a bid would need to build this before they won and enable it the instant they won so they could go to the bids for the following year and sell them on the system (ie before they build their own registration system). Either that, or it would need to be done outside of the concom/bidding system and separately crowdfunded. It would also enable members have their memberships of various worldcons connected together properly (I don't know how many times I've had to chase to make sure that an Advance Supporting gets converted properly to a Supporting so I can buy an upgrade to Attending or cast a Hugo vote or nomination). If done right, it could even allow people to buy pre-supporting memberships (the ones you get to support a bid, which convert into a supporting-to-attending upgrade if the bid wins) for serious bids, which would also make it much clearer what bids were about and how they were doing. 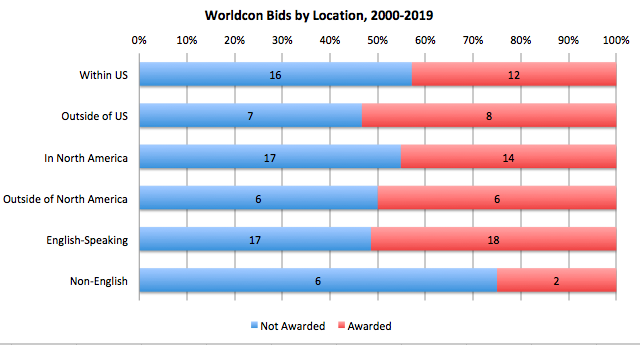 There are all kinds of problems with each Worldcon being essentially built from scratch, but the difficulties with voting remotely in site selection is one of the biggest. There have been various attempts to allow proxy voting or remote attendance at the Business Meeting -- I think there's even something about the latter on the agenda for this year. I hope it passes, because I entirely agree that Supporting Members should have a voice. Because of Worldcon's mobility, there are plenty of people who can't attend every year, but that doesn't mean these folks have any less interest in how things are run, especially but not exclusively the Hugo Awards. I do think renay has a point about some of the stumbling blocks to remote voting being there on purpose. It's a gatekeeping function, and unfortunately there are still too many fans out there who believe in gatekeeping.